AKIPRESS.COM - Lewis Biggs, former director of Tate Liverpool and curator of the 2017 Folkestone Triennial told about his journey to Mongolia in London Review of Books. At Chinggis Khaan International Airport a driver and minder were waiting. We climbed into an old Nissan saloon and set off across Ulaanbaatar for a settlement in the south-east of Mongolia, about six hundred kilometers away. Not long out of the city, we passed a gigantic equestrian statue on a stone podium: Chinggis Khaan. We broke at midnight to eat in a roadside café with walls in gorgeous fake marble reminiscent of Mies van der Rohe’s Pavilion for the 1929 World Fair in Barcelona. I was bound for the fourth Land Art Mongolia biennial, a kind of residency or production workshop for nine Mongolian artists and nine from the rest of the world. The campsite, we were told, was near Dariganga, in the lea of Altan Ovoo, a volcanic hill and a famous pilgrimage site for both Shamanists and Buddhists. The artists and organizers had arrived ten days earlier. The road was good until around 4 am, when the tarmac ran out. Most of the journey from there was on dirt roads. And mostly we were lost. Whenever we saw a ger, we headed for it, got directions, and set off again, only to lose our bearings and inquire at the next one. The venue, it turned out, was a former Soviet youth camp by a small lake near the volcano. I was shown to a family ger, 14 feet in diameter, a palace for a single guest, with a spread of vinyl – herringbone parquet effect – laid on the grass floor. Food was prepared. A goat was flayed and the hooves removed; the skull, shoulders, ribs and smaller pieces were stitched back into the skin along with some black stones the size of a fist, and the package was baked. When it was done and cut open, a geyser of juice spurted into the air and everyone pitched for a gobbet of bone and flesh. The hot stones were passed quickly from hand to hand. The women rubbed the grease on their necks and forearms, a remedy for wrinkles. The 18 artworks were spread across the landscape in various stages of production or dissolution. Several were sculpted from animal bones, and burning dung was a common feature. I worried that these materials were ‘over-expressive’, but realized soon enough that wood is unobtainable on the grass steppe (Mongolians may well find wooden sculpture over-expressive). There were several live events. A Swiss artist contributed an enormous kite to carry a ceremonial ‘gift’, a canister of food and drink, to Altan Ovoo. A team of six men hoisted it into the air, and though it flew OK, it didn’t reach the mountain. Later by the fireside, Dashdondog Badam, a painter – also a shaman – chanted from the sutras and went into a trance, in honor of the mountain, now visible in silhouette against a starlit sky. She distributed dried herbs and vodka to throw on the fire as a libation; quite a bit of the vodka was drunk by the guests. Badam told me later that her great-grandmother had been a shaman, and that several of her family – she’s one of ten siblings – are Buddhists. Buddhism seems to entail upward social mobility while shamanism is more about insisting on your roots. I guess Badam, a successful painter, is a syncretist with two-way mobility. Unable to sleep beyond five in the morning, I prowled around in the dark waiting for sunrise, when there was a performance by Munguntsetseg Lkhagvasuren, another member of the Mongolian nine. She had collected a stock of horse hair and spun it into thread, from which she’d crocheted a large net. She set up a tall pole near the camp, from which she draped the net like a limp windsock, then set off down to the lake, about five hundred meters away. Swatches of beautiful colored fabric were threaded into the net and someone lit a dung fire, which produced a thin wisp of white smoke. Munguntsetseg then emerged from the lake and took up a series of ritual poses at the pole, turning around it and trying to insinuate herself into the net. The plan, the following day, was to pack representative relics of the newly made artworks into the coach, to show at the Mongolian Artists’ Union gallery in Ulaanbaatar, along with documentary photos of the event. There were lengthy delays, as the artists decided what to take or not: Munguntsetseg’s net and cloth would fit, but the pole was too big; the gift-kite was abandoned, and the cord donated to the campsite supervisor’s wife, who wanted it for tying down gers. Badam’s shaman kit – drum, masks and all – were easy to pack. An installation of a dead tree and a lot of sheep’s wool by Gambat Enkhjargal was abandoned. Edgar Endress, an artist and academic from Chile, took back the wooden parts of his large ladder sculpture, but left the metal and wire supports. In Ulaanbaatar he paid an artist to paint the steps with traditional decorative designs. Back at the Chinggis Khaan Hotel, I read that the Mongol Empire was ‘the largest contiguous land empire in history’ (24 million square kilometers, second only to the British Empire by area) and second largest by proportion of world population (24 percent). Mongolia, 750 years later, has a land area of 1.5 million square kilometers and around three million citizens, a significant minority of whom live and work outside the country, many of them in South Korea, which they prefer to Russia or China. Even if all three million had remained, the population density of Mongolia would be 1.9 persons per square kilometer. We were lucky to come across any gers at all when we got lost on the steppe. In Ulaanbaatar, I had a conversation with Gambat Enkhjargal, who had installed the dead tree on the vast fleece. She grew up in Mongolia, completed her education in Utah, and became an artist on her return. Not a ‘traditional’ Mongolian artist like Badam, whose paintings play on Buddhist forms, often with mandala-like compositions; and not a socialist realist, although a number of successful painters and sculptors survive from the communist era. Both the traditional and realist genres are taught at the art school that’s now a part of Ulaanbaatar university, so why be a land artist? Perhaps because anything perceived purely as a ‘craft tradition’ in galleries and markets beyond Mongolia will have a more limited reception than works in an international idiom. In the 1980s, artists outside the G7 countries understood that they were less visible if they didn’t speak or write in English, but at the end of that decade, the big Paris show Magiciens de la terre led the art institutions of wealthier countries to accept that the ‘contemporary’ idioms of land and performance art (though rarely painting or sculpture) were continuous with ancient forms in other cultures. A Buddhist stupa on a mountain top or a Peruvian desert drawing could now be considered a form of land art, and a shamanic trance – as Joseph Beuys recognized early in his career – a kind of performance art. Gambat felt she ‘had to’ become an artist, in defense of her culture. It was simply more relevant, or effective, to frame her concerns in terms of the global cultural economy. 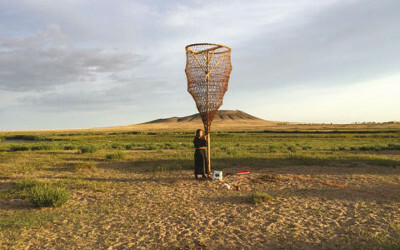 She is not the only artist to take this view: the first Land Art Mongolia biennial was in 2010. She worries that in thirty years’ time her ‘country will not exist’. She doesn’t mean the state, the territory, or even the landscape. Her anxiety is about the pastoral way of life, to which everyone I met is fiercely attached; she is dismayed by the pace of destruction. (It was as she spoke that I began to see the point of the performance in Dariganga with the net and the pole: the artist was tethering herself to a fragile culture, announcing full membership.) Gambat says that she and other Mongolians who studied abroad feel ‘like tourists in our own culture’. Later we went in search of a meal in Ulaanbaatar. We ended up at the Grand Khaan Irish Pub. Going to and from the Artists’ Union gallery, I found a metered cab. The driver wanted to bargain a price, but the meter ran anyway. It had an LED display with an energetic little horse. The horse galloped when the car was moving, and stopped when it came to a halt in traffic. At the gallery there was a show of paintings from Japan, South Korea and Mongolia. The Mongolian works are obvious even to the untrained eye: invariably there is a horse somewhere in the composition. The gallery manager was about to strip out the show to make room for the Land Art Mongolia exhibits. She spoke fluent Spanish, having worked for five years as a contortionist with a circus in Barcelona. According to her, ‘all the big circuses from America and Europe recruit in Mongolia’ because Mongolian women are famously flexible. That afternoon, during a debriefing at the gallery with the media and a small audience, the non-Mongolian artists confessed that their understanding of ‘nomadic’ culture had changed. Fluidity, not mobility, now struck them as the central point. They had found a way to customize their experience as a lesson in mixing up disciplines and crossing boundaries. I can see how they might: the steppe is empty and undifferentiated; there are no boundaries, no landmarks, only herds of animals that appear and disperse in a matter of moments; in this space thoughts and contradictions quickly coalesce into a kind of fuzzy, feelgood humanistic ball. Afterwards, at the top of a tall building in the city center, we gazed at a massive chalk drawing of Chinggis Khaan’s head on a grassed slope at the edge of the city: a monumental piece of land art, neither mobile nor fluid.